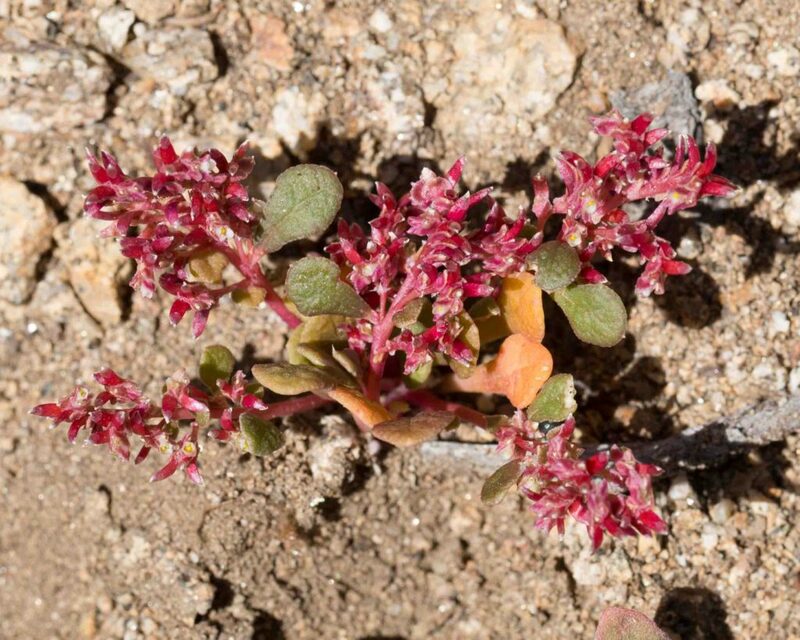 This is a small plant whose flowers are an intense deep rose to red color. 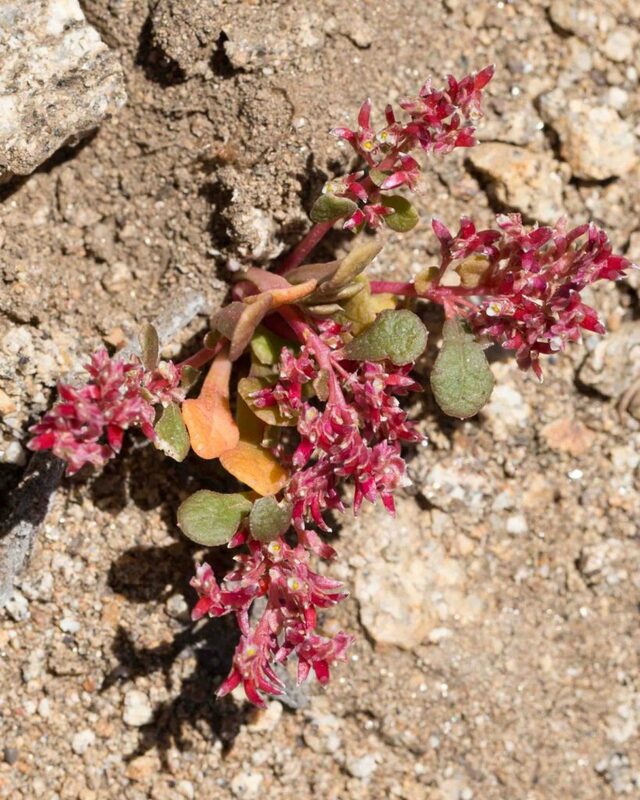 The flowers tend not to open until late morning but their vivid color makes them easy to spot. 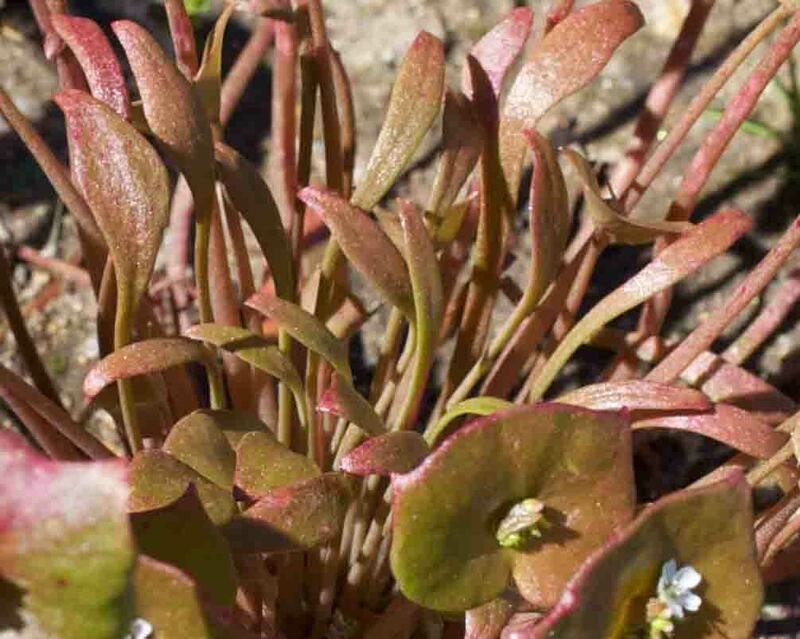 The leaves are linear to oblanceolate, often ciliate along the margins. 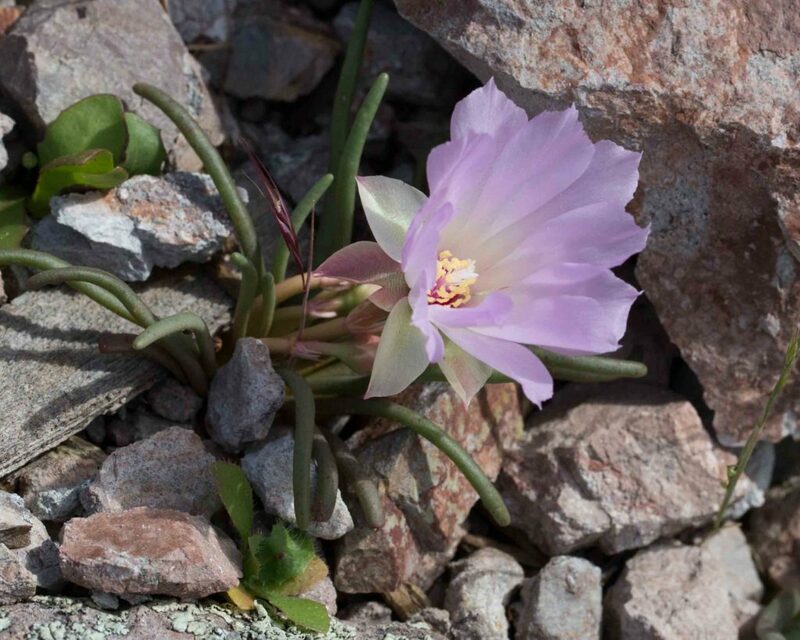 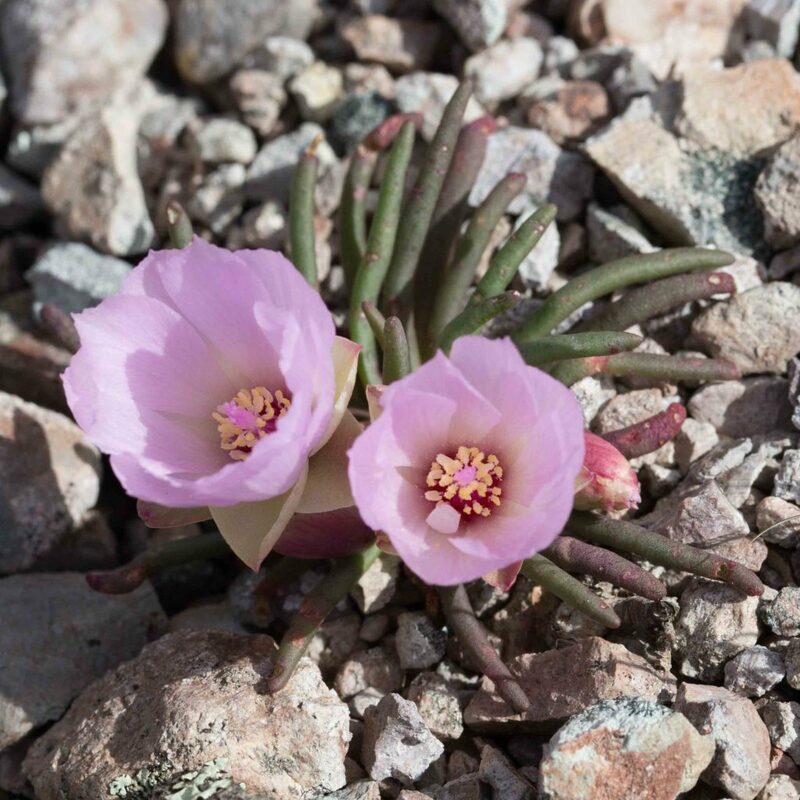 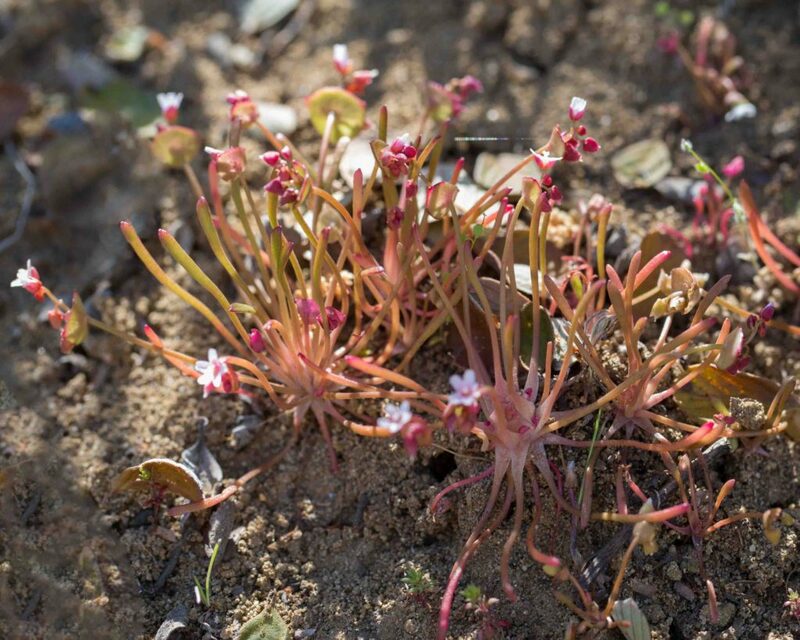 This species can be distinguished from the rare Brewer’s Red Maids (Calandrinia breweri) by the number of its stamens (7–14) and the fact that the fruits are more or less enclosed by the calyx (clearly visible in the second photo). 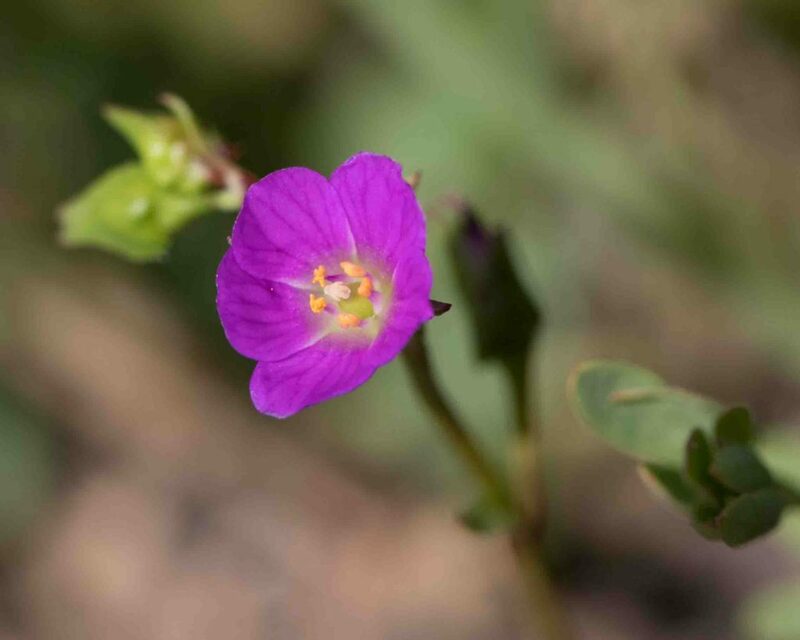 This rare calandrinia is similar to Red Maids (Calandrinia menziesii) though with stems that may be ascending as well as prostrate, giving the plant a slightly bushier appearance. 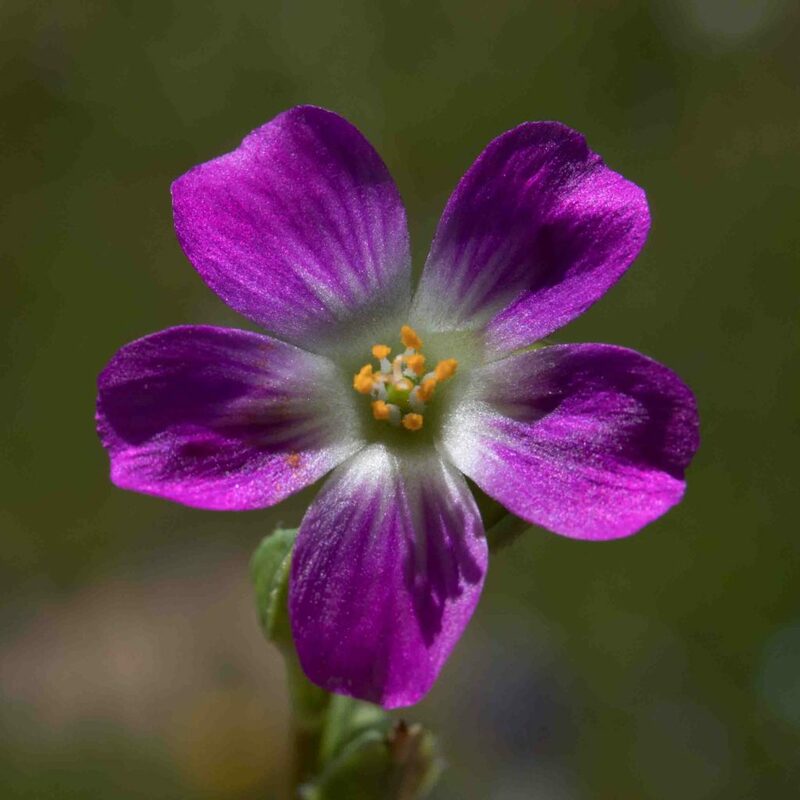 It can be distinguished by the number of its stamens (5–7) and the fact that the fruits may be 2× as long as the sepals and protrude prominently from the calyx. 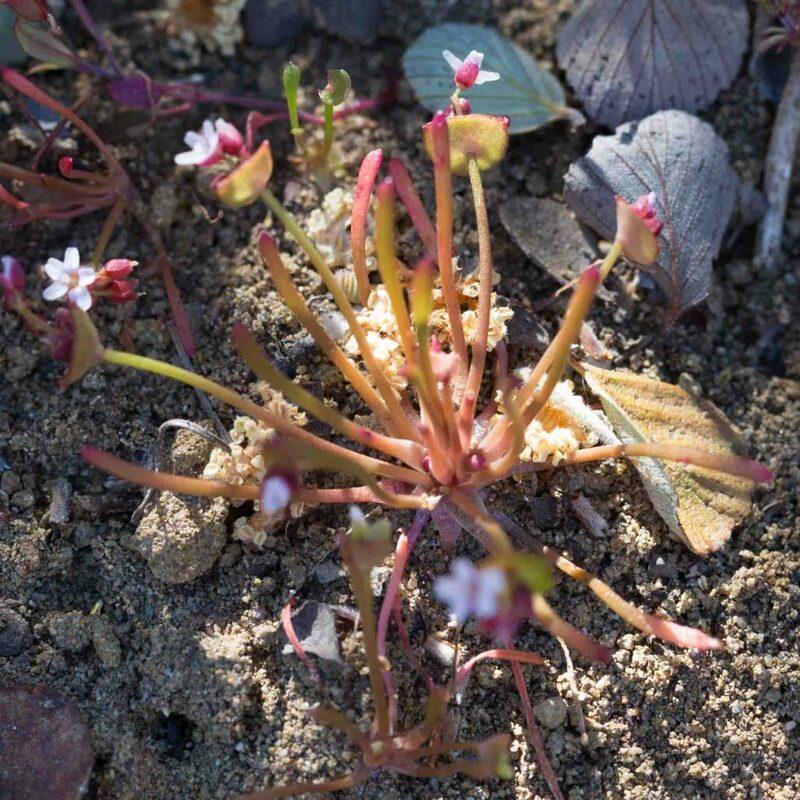 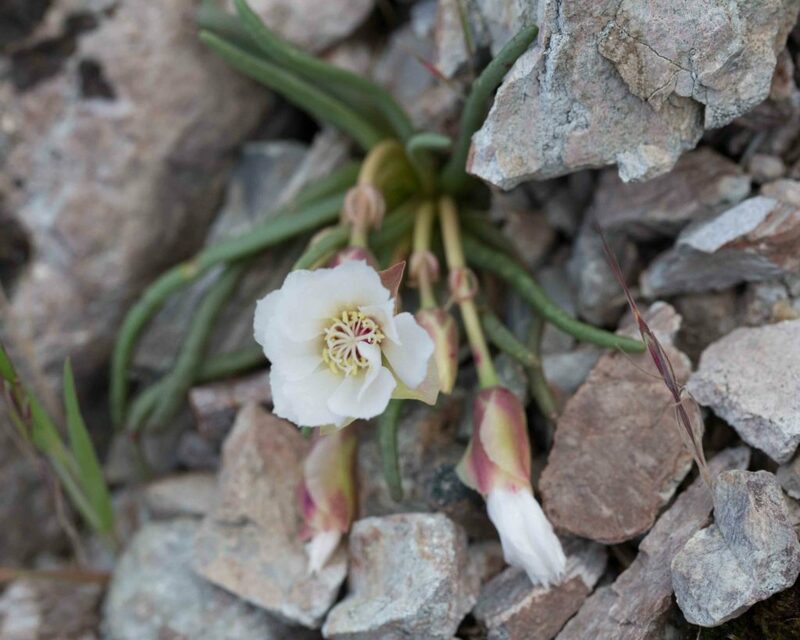 This is a prostrate plant with a rosette of fleshy, spatulate 1–6 cm leaves, reddish stems and clusters of tiny white or reddish flowers surrounded by three triangular sepals. 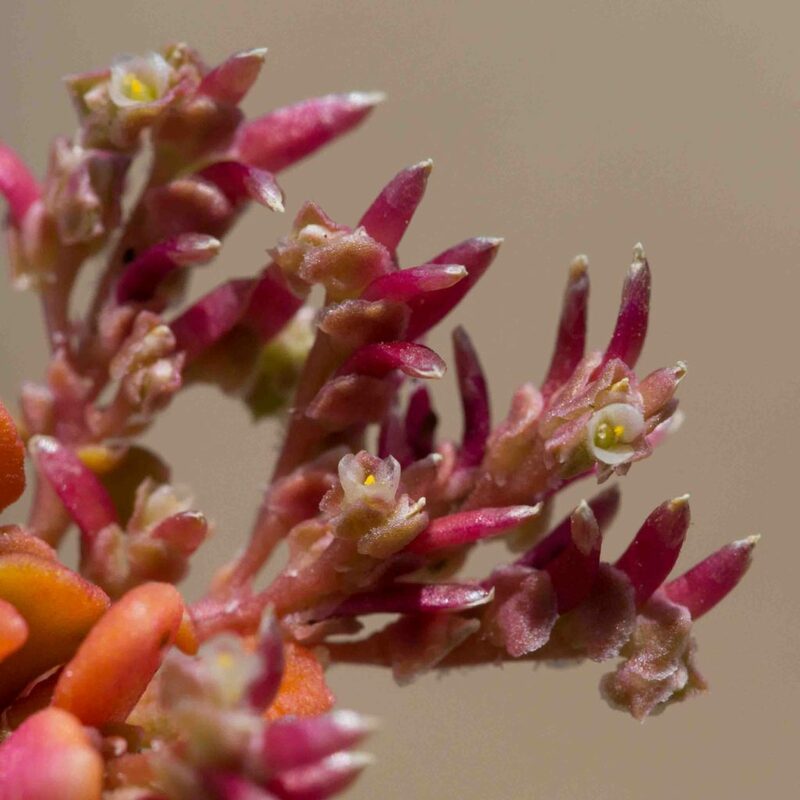 The fruits are linear, 2–4 × as long as the sepals and clearly visible in the second photo. 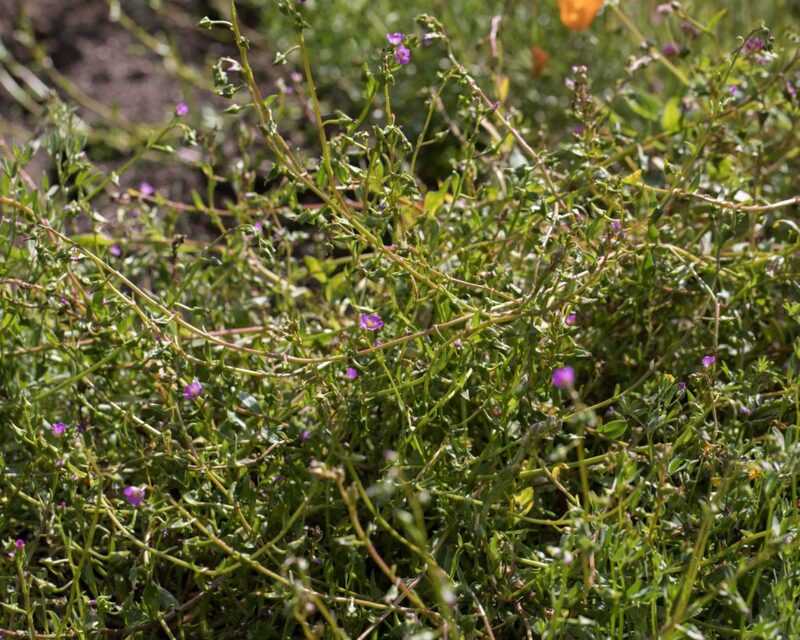 Extremely common, sometimes weedy and most easily recognized by its large leaves which completely surround the stem. 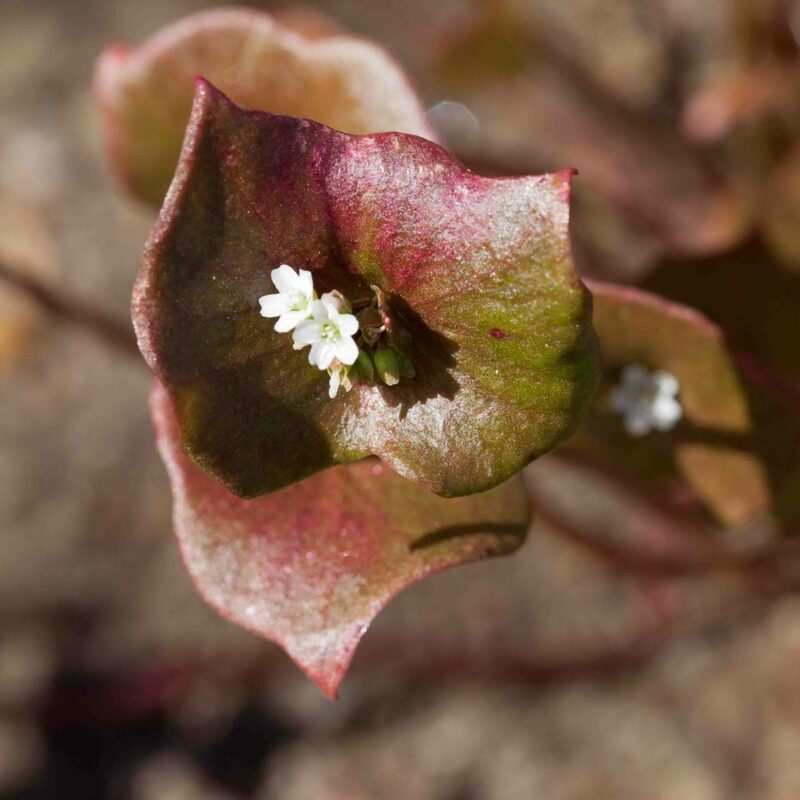 The first leaves to appear in spring are almost linear, gradually developing into the roundish leaves of the mature plant. 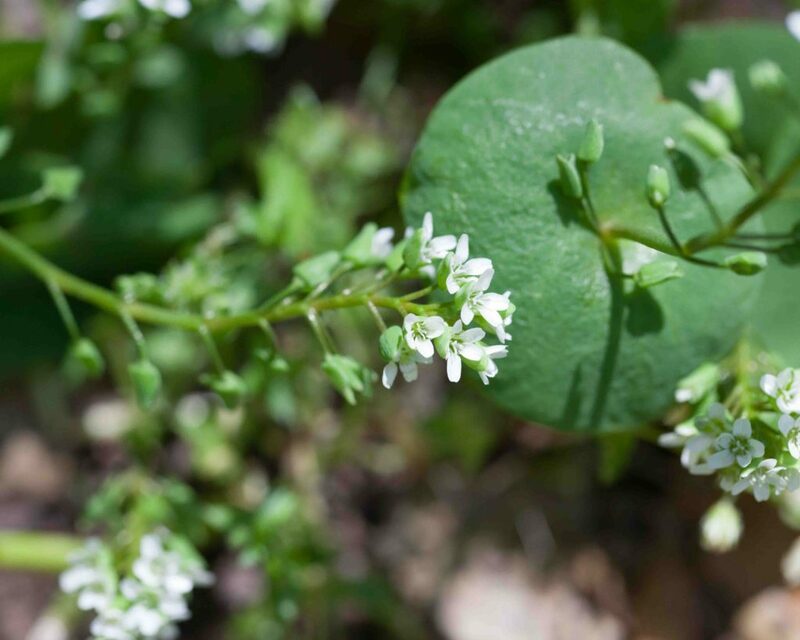 The small flowers are generally white (occasionally pinkish), with a few appearing first on a short peduncle just above the leaf. 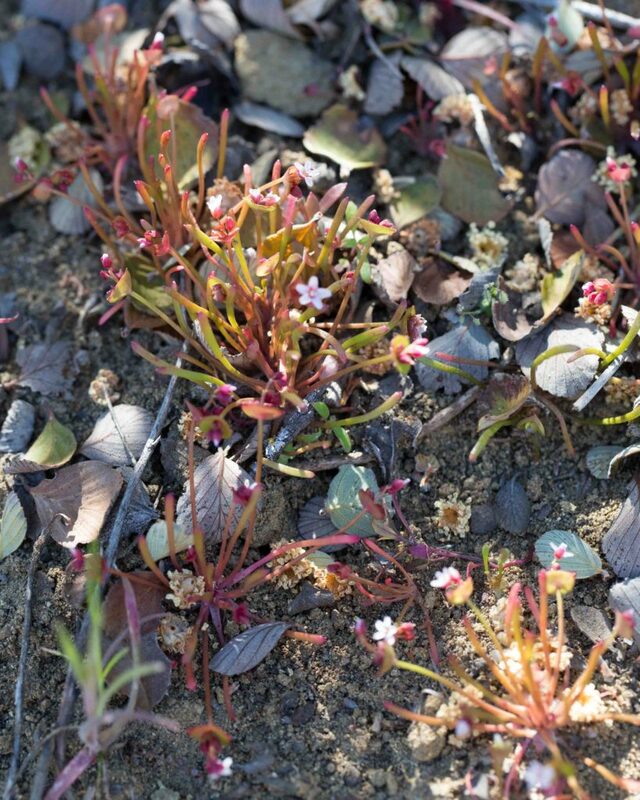 The peduncle gradually lengthens and more flowers appear, as many as 40 in a small or elongated cluster. 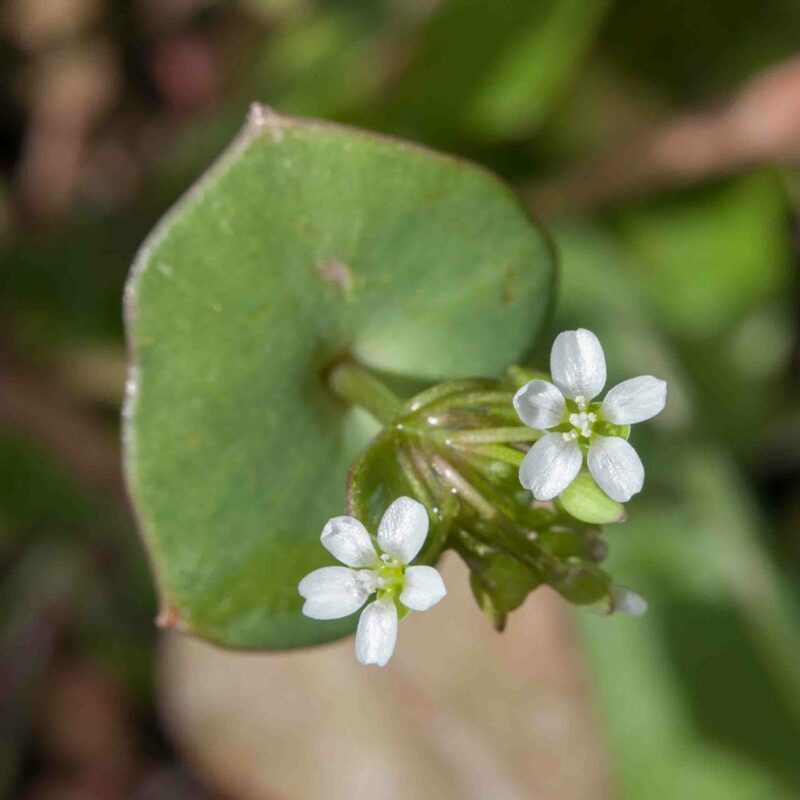 Much less common than Miner’s Lettuce (Claytonia perfoliata), with similar flowers but much smaller leaves (< 5 cm, about half the size of those of Miner’s Lettuce). 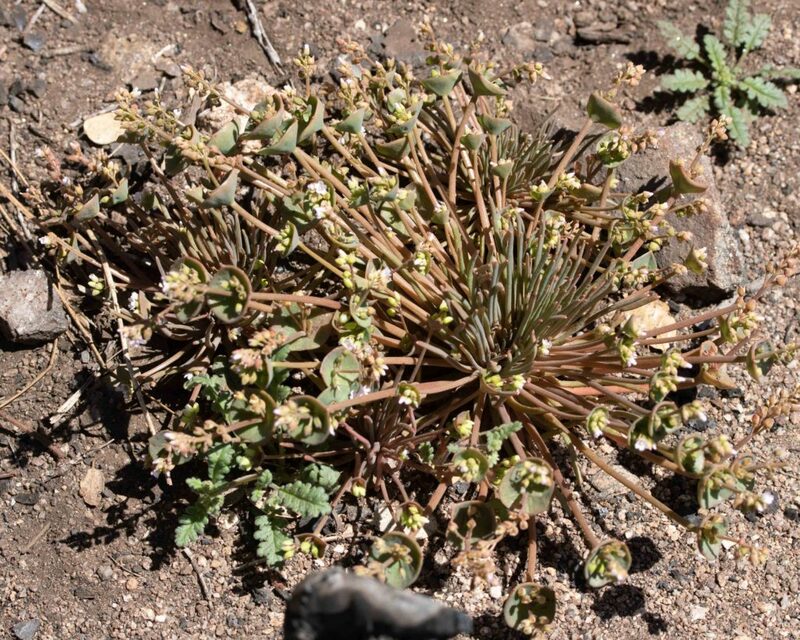 The leaves and stems may be either green or reddish. 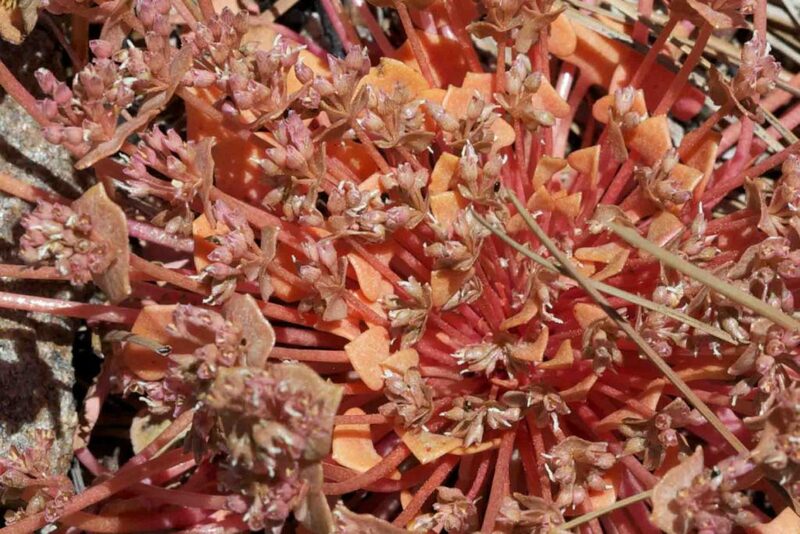 The basal leaves are distinctive, long (1–18 cm), linear to oblanceolate in shape. 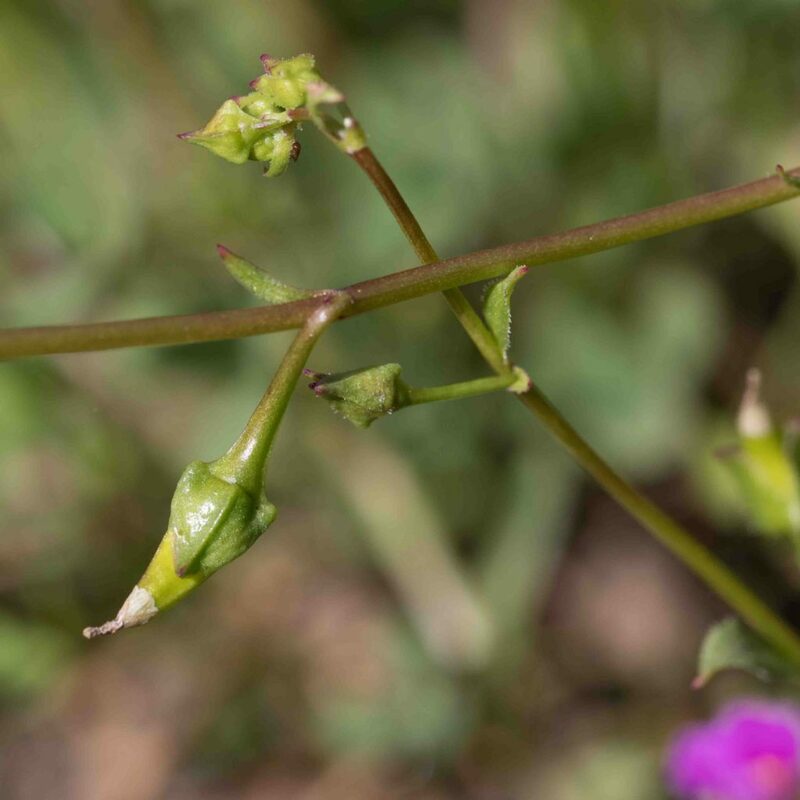 Cauline leaves are shorter (< 6 cm), elliptic or diamond-shaped if they are not fused into a round or squarish disk subtending the flowers. 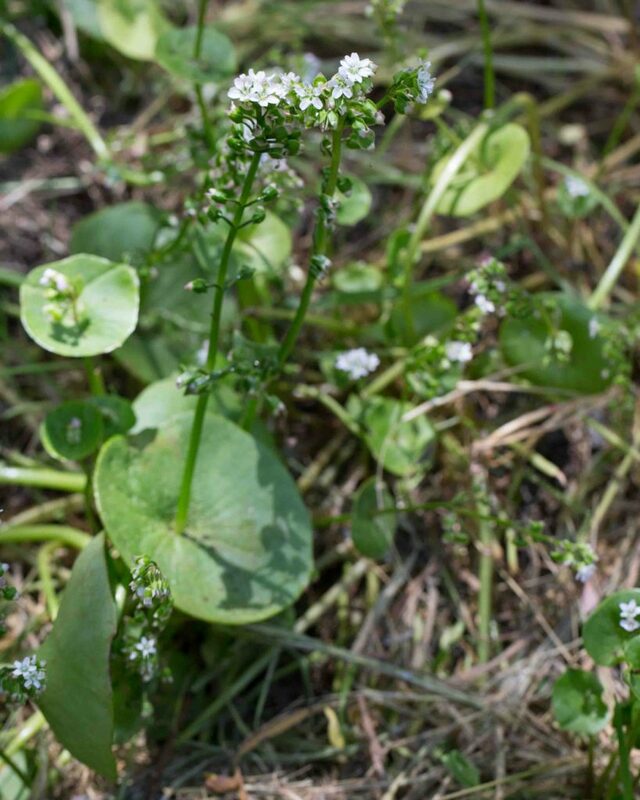 This can be confused with Narrow-leaved Miner’s Lettuce (Claytonia parviflora), with leaves and stems that may be green but are generally reddish. 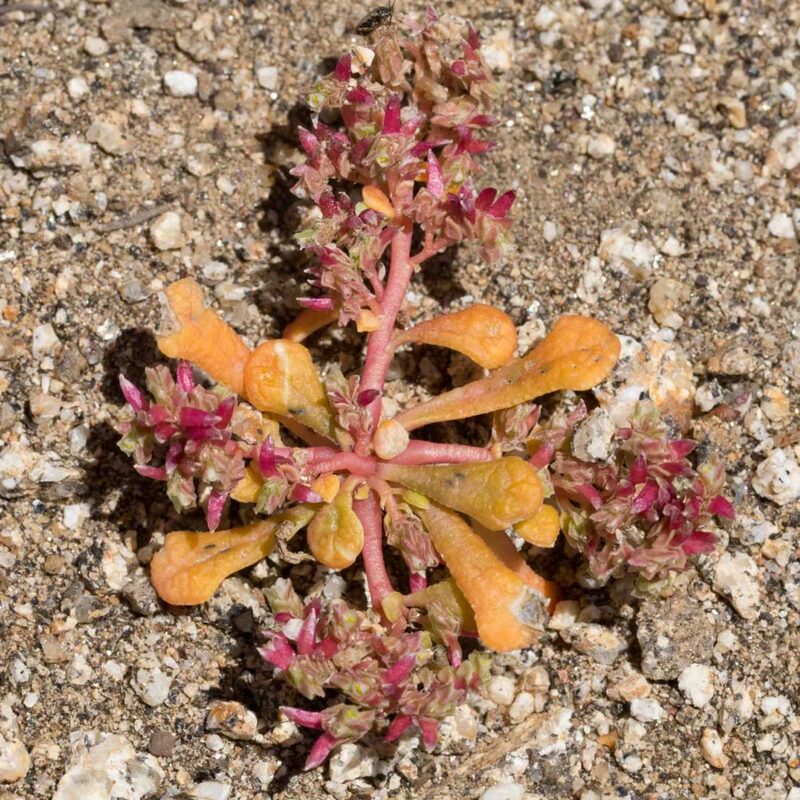 It is distinguished by the shape of its basal leaves which have blades less than 3 × as long as wide and generally tapering abruptly into the petiole. 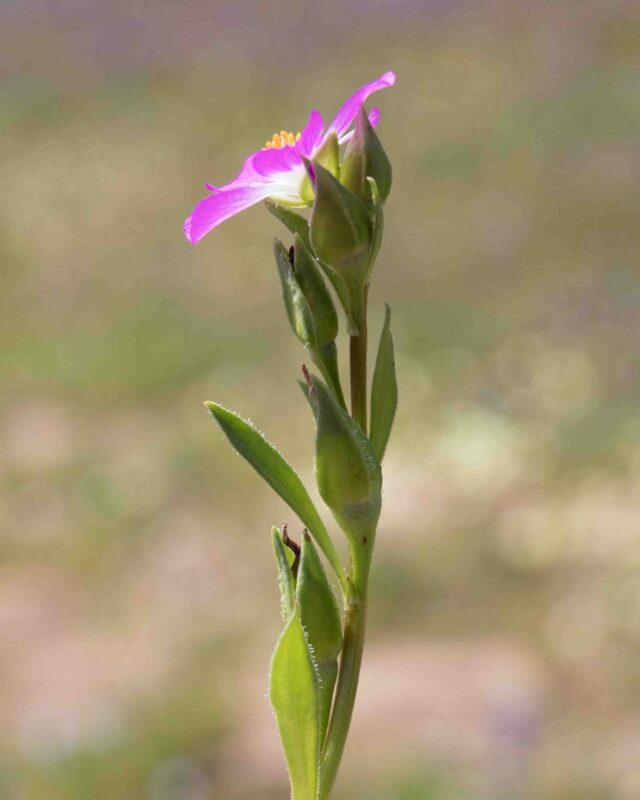 The two subspecies are distinguished by the shape of their basal leaves; subsp. 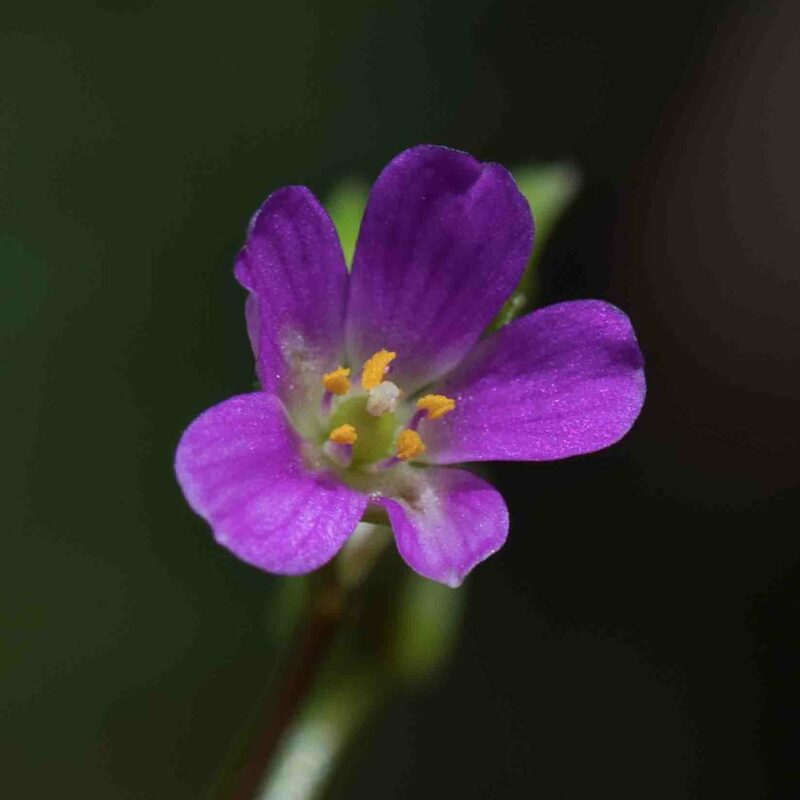 rubra has basal leaves which are elliptic to obovate with a wedge-shaped base and subsp. 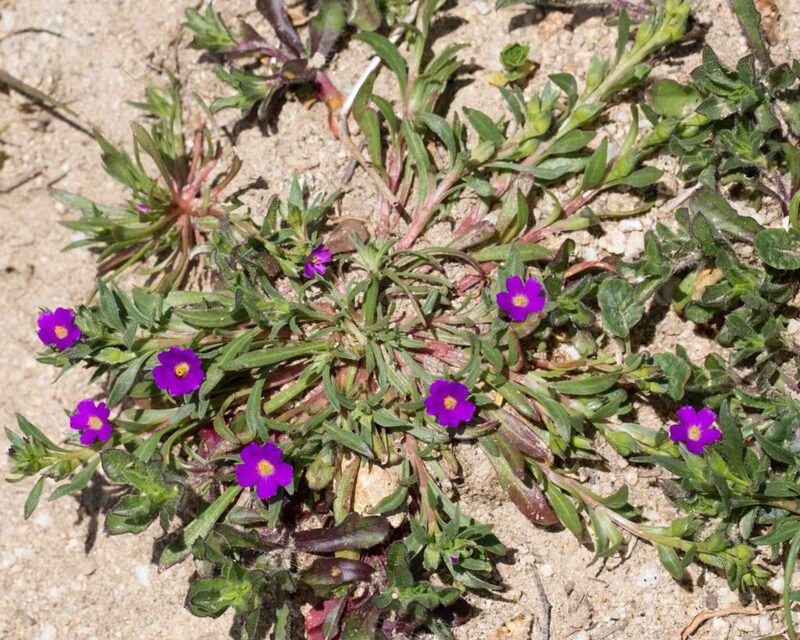 depressa (right hand photo) has basal leaves which are diamond-shaped to deltate and more or less truncate at their base. 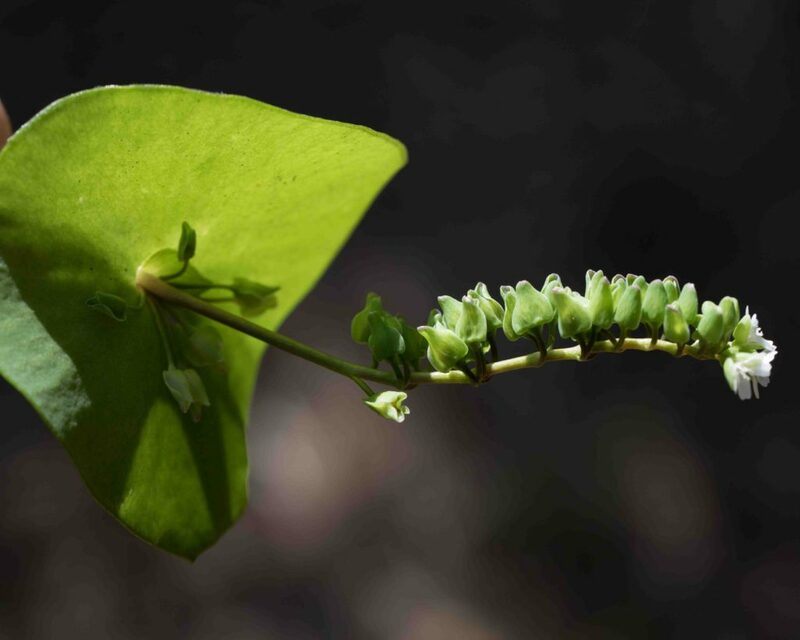 The fused cauline leaves have a noticeably angular appearance. 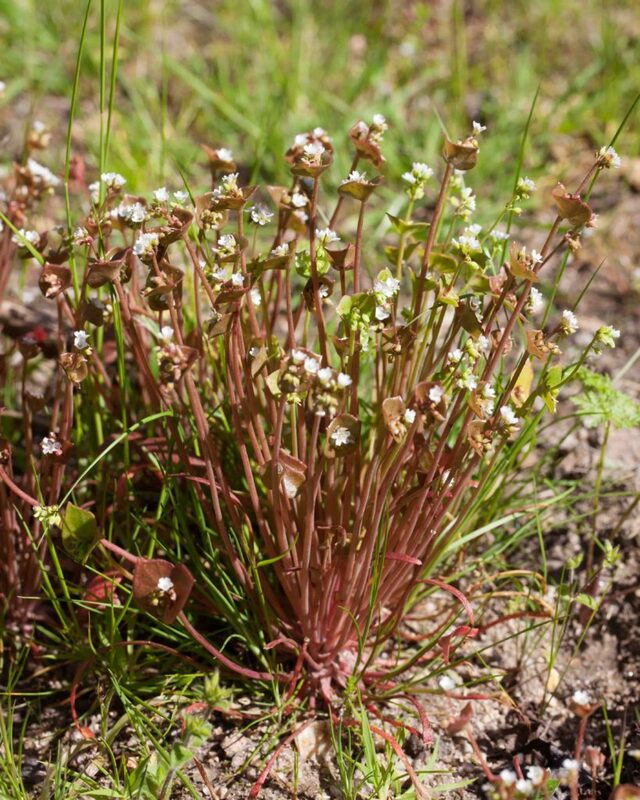 The plant is more or less prostrate with a rosette of linear, fleshy leaves. 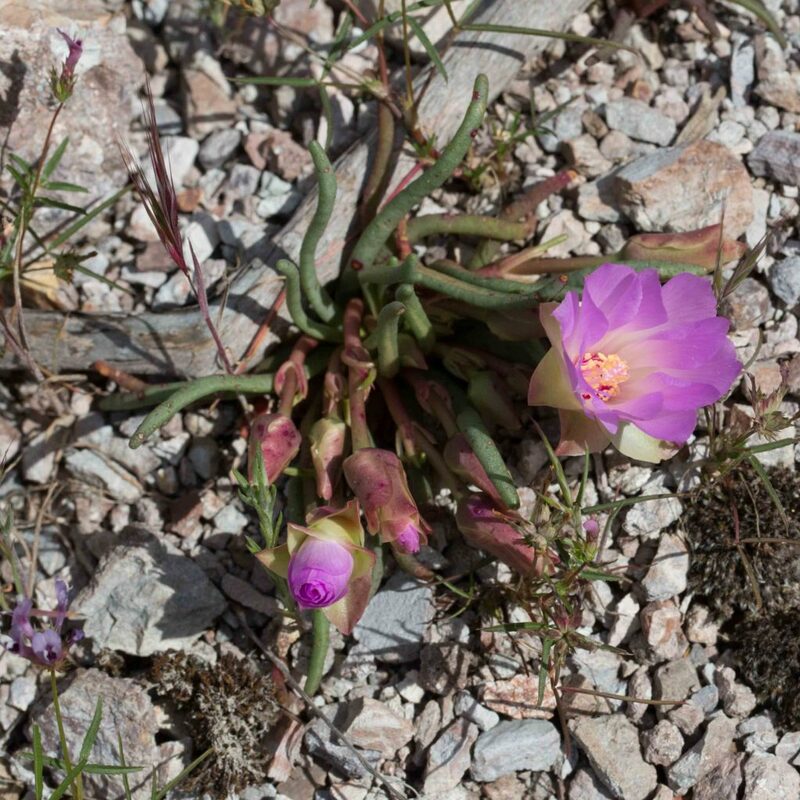 Flowers are pink to white, 18–35 mm across and varying from narrowly bowl-shaped to wide open and more or less flat. 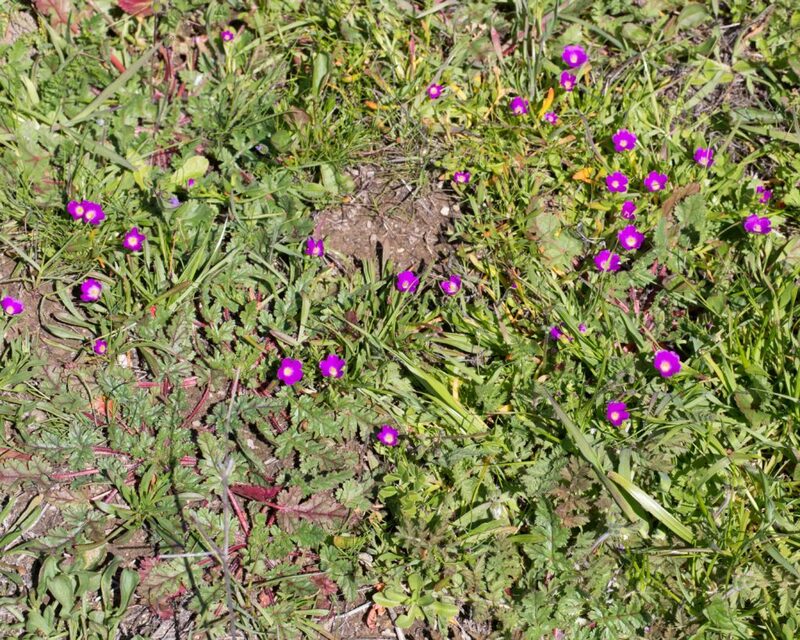 Uncommon, found only in the Indians and Fort Hunter Liggett and at the Pinnacles.